Stephen Frost and his Improv Allstars. 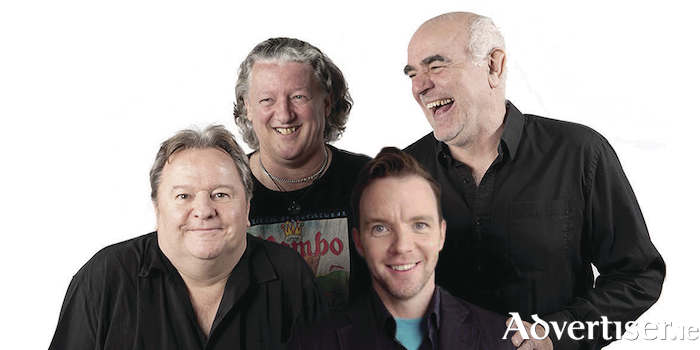 BIG, BALD, bushy browed, and an improv maestro - Stephen Frost is something of a comedy legend and he will be leading his Improv Allstars into action at the Róisín Dubh next week. The Stephen Frost Improv Allstars, with special guest Dermot Whelan of Today FM's Dermot and Dave, play the Dominick Street venue on Friday February 16 at 8.30pm. The show will involve adult content, delivered childishly, by four brave performers with no script and not the faintest idea of what will happen. Through improvisation and the support and suggestions of the crowd, they will create surreal sketches and comic dramas off the top of their heads. Joining Stephen will be Steve Steen (Whose Line Is It Anyway, Have I Got News For You, and Blackadder The Third ); Andy Smart, a member of The Comedy Store Players, the longest running comedy show in the world according to the Guinness Book Of Records; and Dermot Whelan, who regularly performs at the Dublin Comedy Improv in The International, and has appeared on Republic of Telly.